I had bought a groupon for the VIP car on the highroller in Vegas. The highroller is one of the new attractions in Vegas they call it the world's largest observation wheel its like a nice ferris wheel. 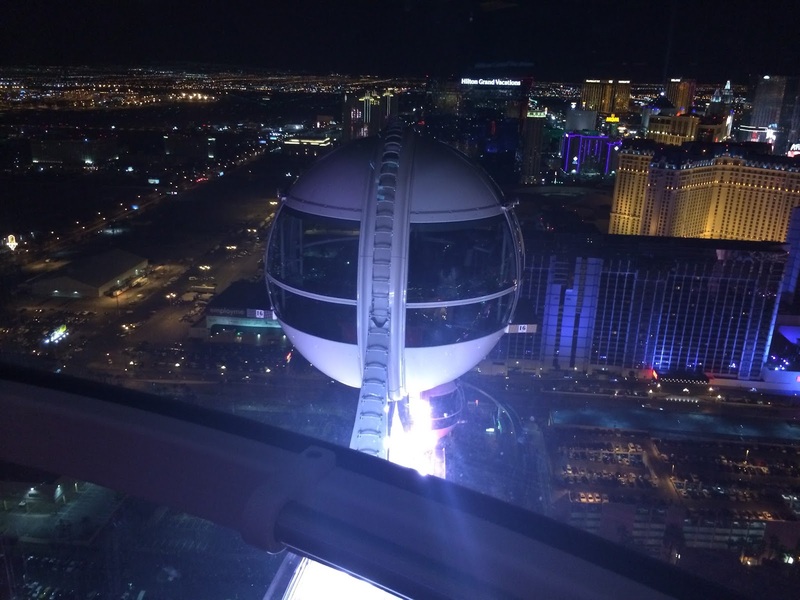 The ride is 30 minutes overlooking the Vegas strip. The VIP car's have private bars on them and there is an option to go during the day or at night. 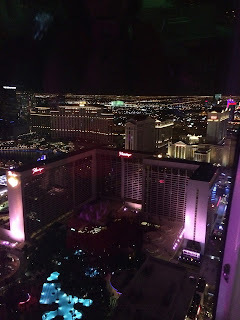 We were staying at the Linq and the high roller is connected with the hotel so it was a short walk away. I don't drink but I preferred to be in a private car away from kids and my companion was capable of drinking enough for two people. We chose the night as that is the best time to see vegas. There wasn't a line up at all when we went it was around 11 pm and they gave us some coupons for the brooklyn bowl and the souvenir shop but we didn't use those. There were only 4 people in our car. Our bar tender was very nice but he was bored the drinks were unlimited but there is only so much to do when you only have to serve a few people. We got our drinks the standard free bar drinks including juice and pop for me. There are benches to sit on or you can stand if you want and there are windows on both sides so you can walk around and look out the windows. The view is great the car moves very slowly so you have time to see everything. My pictures are with my phone through the window so the view was really nice. There was tv's with a guy doing a commentary and trivia. It was like a bad after school special that part needs to be improved. My friend found her drink to weak so the next one she asked for a stronger one and I heard her yelling I said strong not kill me. The bartender put a bit of almost everything that was in the bar in that drink including pop and juice. My friend who can drink a lot without getting drunk got drunk after that drink but at least the bartender was following instructions. I don't think we got our money's worth on the alcohol part but we did on the view and the privacy of the car. This is one of those attractions that would be good to do once. The prices are much higher than they used to be put there are coupons everywhere we also did get a coupon book with our stay at the linq that had a highroller coupon in it.